Jumbo Shrimp & Sea Scallops Surf n' Turf! Home > Mother's Day Dinners! > Surf & Turf Dinners! 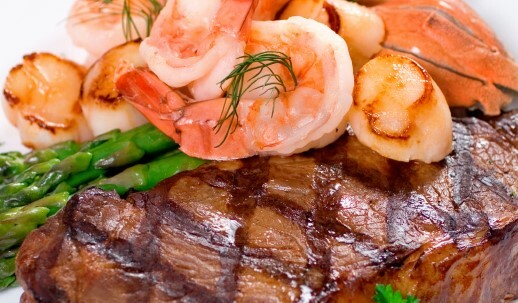 > Jumbo Shrimp & Sea Scallops Surf n' Turf! A Popular Holiday Dinner Choice! Our Shrimp And Scallops Surf & Turf! 1 Lb. Of Our "Jumbo" (8-12 per lb.) Gulf Shrimp, Two Huge 8oz. Filet Mignon and 1 Pound Of Awesome Sea Scallops! All orders also come with a personalized card with your message & Cooking Instructions for easy preparation! This Is A Great Surf And Turf Dinner Choice! Complete With 1 Lb. Of Our "Jumbo" (8-12 per lb. )Shrimp, Two 8oz.Filet Mignon and 1 Pound Of Native Deep Water Sea Scallops! An Outstanding Gift Choice And Also A Great Gift Idea For The Holidays, Anniversaries, Birthdays, or just a Great Thank You! Order This Shrimp And Sea Scallop Surf And Turf Lobster Dinner By 10am EST, And Enjoy It For Dinner Tomorrow! Our Surf And Turf Dinners Also Make A Great Gift Idea For Your Favorite Seafood Lover! How Easy Is That! We loved the scallops and the shrimp, and the tenderloins steaks were outstanding! This was a great gift! thanks Glenn, great choice! Perfect! I must say I was impressed with the quality of seafood and beef. We enjoyed it completely and it was worth every penny! keep up the good work Capt. ! Ray T.
The shrimp were fantastic, the scallops amazing, and the beef was tender and delish! We will order again ,and again! thinking the stuffed shrimp next time, they look wonderful!